Three-Piece Set. Dalmatian-print, stretch, crushed velvet dress with hood, faux-fur trim and tail. Includes matching boot covers and dog-collar choker. Seven-Piece Set. Adorable off-the-shoulder button-front peasant dress with plaid patches and straw trim. 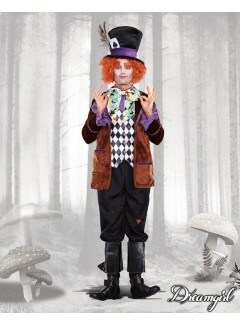 This versatile costume can be worn with or without included Roxie short. Includes matching boot toppers, straw hat, rope choker, belt and wrist ties. Three-Piece Set. Whimsical bright pink and purple striped panne velvet dress with attached tail and shaggy fur hood with cat ears. 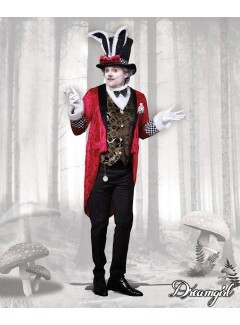 Includes fingerless gloves, choker and boot covers. Shown With: DW11366 “Long Wavy Light-Up Wig” Lavender/Turquoise/Fuchsia Mix; sold separately. DG11182 - "BIG BAD WOLF"
Four-piece Set. Playful red plaid jumper dress with large front pocket and faux-fur trim. 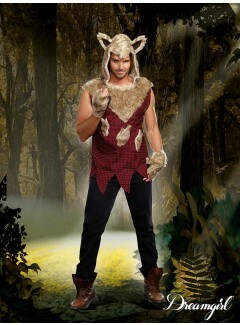 Includes shaggy faux-fur hood with wolf ears, matching fingerless gloves, and belt with attached furry tail. Pairs well with DG11576 arabian princess costume. Four-piece lion costume. Furry zip-front romper with oversized hood which can be worn with included fur trimmed skirt; Fur-trimmed glovettes; Lion tail. 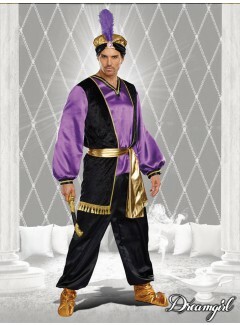 Three-piece arabian princess costume. 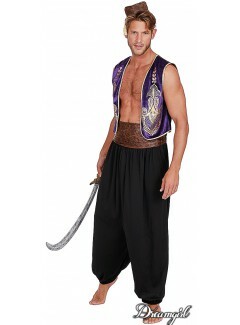 Includes an off-the-shoulder top with rhinestone embellishment and adjustable shoulder straps; Matching harem pants have a metallic gold print at hemline, and attached printed over skirt; Headpiece. Shown with DW10813 “Harem Princess Wig”, sold separately; Jewelry not included. Five-piece Queen of Hearts costume. Black velvet bodysuit with embellished underwire cups and snap crotch has an attached heart printed sheer skirt and peplum; Heart-shaped satin collar; Golden heart choker; Poofy sleeves; Crown. Two-Piece Bo Peep costume. Full party dress with polka dot skirt, ruffled peplum bodice with sheep print, off-the-shoulder styling with adjustable straps, a back zipper; Bonnet headband. Gloves, socks, choker, petticoat, and shepherds crook not included. 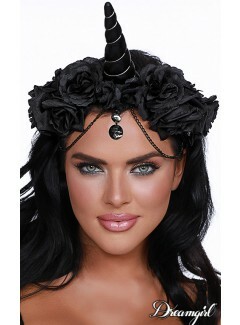 Black unicorn headpiece with roses, chains and rhinestone trim. Beautiful rose-colored multi-layered skirt with gold foil over print, tie-front closure and high-low hemline. One-Piece Set. Multi-layered sparkly skirt with tie-front closure and high-low hemline. Two-piece set. Beautifully detailed fairytale dress includes underwire foam cups with pleated ruffles, embroidered heart trim, and lace-trimmed apron. Includes full length hooded satin cape.